Find as many words as possible from a pile of 7 random letters against the clock. Get a 'run' of words from the same set of letters to increase word score. US and UK spellings. 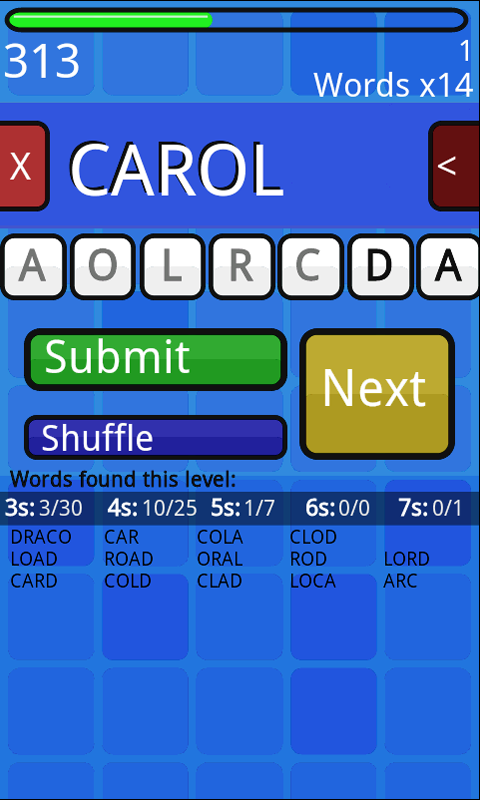 Select letters from the 'Rack' in the middle of the screen to form a word of 3 or more letters. Press the 'Shuffle' button at any time to rearrage the letters in the rack, to maybe give you inspiration. Press the 'X' button to clear your letter selection and start again. Press the '<' button to delete the last letter selected. Press the 'Submit' button when your word is complete. If the word is listed in the dictionary and the word hasn't been already used on this level the word is accepted. The word will be added to an area at the bottom of the screen for reference. If you can't find anymore words from the rack then press the 'Next' button to advance to the next level and receive new letters. The more words you find on any one level the higher the score you get for that word. 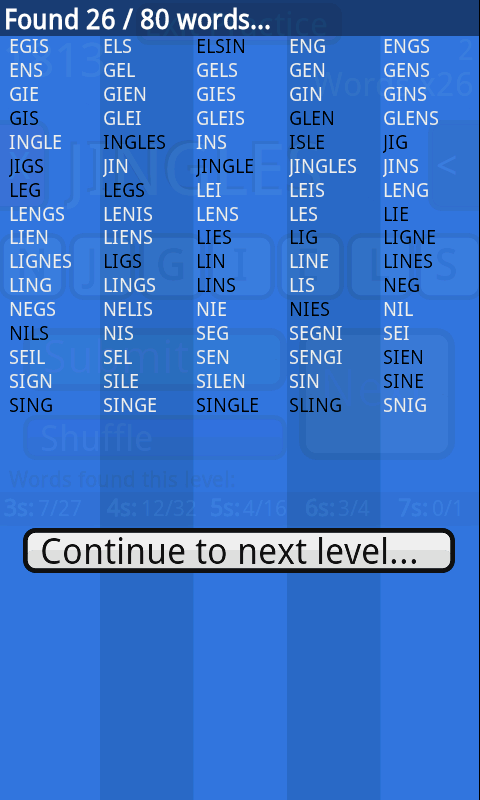 This score is reset when advancing to a new level so it pays to find as many words as possible on any given level. The more letters a word contains the more time is added to your game for finding the word. There are a number of achievements to complete outside the normal rules of the game. These include having a particularly good run of words within a level, having consistently good runs over a number of levels, and finding a set number of words in each word length group. There is a small bonus added to you time when you start a new game based on the number of achievements you have completed. I believe there is an option to uninstall in Settings > Applications > Manage Applications > Word Run. If that doesn't work, try restarting the phone and trying again.